The pharmacie de l’Eléphant opened on 6 December – St Nicholas’ Day – in 1996. Initially, Mr Schinker worked with one pharmacist and one pharmacy assistant. The total area of the pharmacy at the time was 130 square metres. Mr Schinker realised very quickly that this was not enough, in terms of both area and staff. In 2000, the pharmacy was extended by adding an extra 100 square metres on the lower floor for an office, a store-room, and a room used for meetings, for providing advice to patients, and as an on-call room. The next change involved extending the ground-floor area, resulting in a total area of 300 square metres, including a dispensing area of 80 square metres. The final stage was the installation of a robot which lets us work as much as two or three times more quickly, with more items in stock yet occupying less space. Our permanent stock stands at between 12 000 and 20 000 medicinal items. The pharmacy currently has a staff of 13 – seven pharmacists, five assistants, and one housekeeper. We offer our customers two magazines: Apotheken Umschau and Letz Be Healthy. 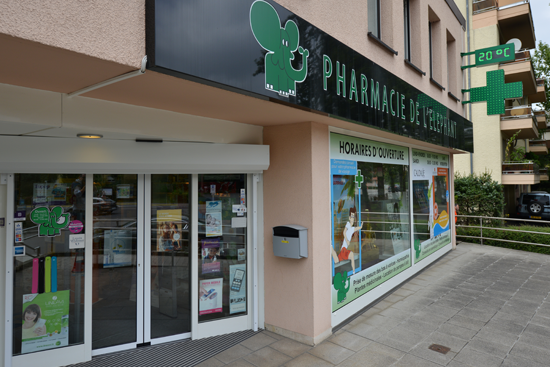 The pharmacie de l’Eléphant provides ramp access for people with reduced mobility. Our large private car park has 34 places; two are reserved for people with reduced mobility. Another thirty parking places are also available alongside the pharmacy. There is also a convenient bus stop opposite and next to the pharmacie de l’Eléphant. Near our pharmacie de l’Eléphant, you will also find a medical centre, the Zithe Clinic, an interior design shop, a branch of the BIL bank, and an optician.